Enjoy Exclusive Offers On Travel With Klook Promo Code! Klook is a one-stop destination connecting travelers all around the world with their dream destinations without any hassle. With an aim to serve you the most enjoyable trips, Klook enables you to discover and book amazing tours at unmatched prices and that too with just a few clicks. Whether you are seeking for an adventure, fun sightseeing, entertainment or foodie travel to any destination across the world, Klook is here to help you plan your trip in the best possible and most convenient way. Moreover, you get to save huge amounts as Klook has got to offer you the widest array of exclusive discount codes and vouchers that can be redeemed to enjoy maximum benefits anytime and anywhere. To review and avail all the latest Klook voucher codes and discount codes, all you need is to join hands with CollectOffers, you only trusted coupon code provider across Asia. Sakura Sale - With the use of this discount code get $15 discount on your activities with minimum spending of $200. Satisfy all your cinematic fantasies and enjoy a full day of blockbuster fun at Universal Studios Singapore. Buy your ticket at a discount of 10%. Jurong Bird Park is one of Singapore’s great family attractions, catch the High Flyers Show, featuring impressive free-flying performances. Buy your tickets at a discount of 15%. Browse the landing page to book any activities, attractions, food & drink, sights and passes in any destination given here and enjoy the wonderful discount of up to 60%. Meet your favourite characters at this amazing shows. Book one day ticket for Hong Kong Disneyland Park and also get Meal coupon combo with up to 21% OFF. Apply the discount code to get EXTRA $1.73 OFF. 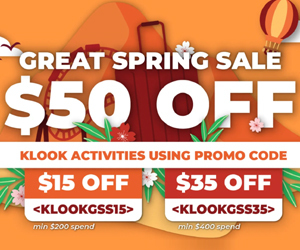 Don't miss the chance if you are a new user book your favourite deal and with the use of this Klook promo code and get $2 discount on your booking. It's time to save huge on your savings. Just apply the promo code to get $10 discount on your first purchase with minimum spending of $80. Only for mobile app users. Use the discount code and pay with your Citibank card to save 5% on tours and sightseeing, spa, and dining options available in selected destinations (not valid for Japan Rail Pass). If you are SAFRA member enjoy a 5% discount on any activities with a minimum spend of $100. Excluding Klook Gift Card, Universal Studios Japan Admission Tickets, Universal Studios Japan Express Passes and Japan Rail (JR) passes. Don't forget to apply the discount code. Enjoy having Internet access anywhere in the world thanks to the Pocket WiFi devices! Apply a given voucher code and pay with Mastercard to enjoy to get 15% OFF a device rental from Klook. Hurry! If you have HSBC credit card, then enter the Klook Singapore code at the cart to enjoy an EXTRA 3% discount on all activities. It excludes Christmas Gift Card, JR Pass, Universal Studios Japan Admission Tickets and Express Passes. Make your payment with HSBC credit card to enjoy a 3% discount on Tours & Sightseeing activities. Check this landing page now! If SAFRA member plan to book any activities for the first time, use the below discount code to get $10 OFF with a minimum spend of $100. Only app users. Book the best adventurous activities in Singapore like night safari, indoor surfing and more. Apply the discount code to receive a discount of 5%. Only for first-time users. Plan your holiday in a given destination like Bangkok, Phuket & Pattaya and explore its activities with 15% OFF by using the discount code. Whether you're an adrenaline junkie, foodie or history buff, there are literally dozens of fun, exciting and memorable things to do in Thailand. Book your favourite activity and enter this promo code to take 8% OFF. Insert this promo code to enjoy $1.73 OFF your first booking with this app. Download the app now to enjoy this deal! If you are a fan of contemporary art, the Fran Daurel Museum is a must on your visit to the Poble Espanyol. Enjoy your entry with Barcelona Pass and save €14.00. Plan your trip to Chiang Mai, is filled with fun bucket list worthy things to do such as a ride in a tuk-tuk, chat with a monk at a temple and get a Thai massage in Thailand. Only at Trip Guru from $4. Discover the best activities in Phuket including Phuket Shared Arrival Transfer, Phuket Shared Departure Transfer, Phuket Introduction City Sightseeing Tour. Book online from $32 with Trip Guru. Food Fridays with Klook is almost here, Beat the heat and enjoy ice cream and desserts with 50% OFF. It's that time of year again to have a splashing good time at Songkran! Pick any deal from this offer page and buy 2 get 1. Come and discover the top attractions, activities, sights or more you should not miss when travelling to Seoul. Book now with up to 50% OFF. If you are an existing customer then enjoy $8 discount on any activity with Apply pay. Plus, receive a 5% discount on tours and activities. Download the Klook app on your device. Apple users enjoy this deal, book your activity with Klook and enjoy a discount of $3. Offer is valid for new customers only. Download the Klook app now! Experience the Best of a Destination at Best Prices! The Klook promises the travellers very easy and customized travel experience with its customer-specific travel packages that provide the best possible way of exploring attractions, doing activities and much more by serving a handcrafted selection of the travel destinations across hundreds of popular tourism hubs. The company follows a basic principle that asks the traveller and then curates the personalized travelling experience individually for the customer depending on his preferences. Klook has a specially curated by a team of experts who explore and assert the best offerings that a travel destination has to offer. It also gives the customer the choice to select the experiences they want to have on the trip. Klook gives the most awesome trip to explore a travel destination according to the customer’s own liking. The travel company also claims the best price guarantee on every booking and if the customer could find a better deal on the same, it refunds double the amount of the difference between prices of the two deals. Klook is a Hong Kong-based online travel booking platform which was founded in the year 2014. Within a span of a couple of years, the company emerged as a promising brand in the travel and tourism industry of Hong Kong and expanded its services to many other neighbouring countries of East Asia. The company saw a very prosperous and exponential growth rate to become a global brand to reckon with. The online travel booking services of Klook are now extended to all over the globe from Japan to Canada. The company has become a part of the Unicorn 500 to establish the mettle of its product and services amongst the leading international brands. The company gives users a plethora of travel booking options which follow a fluctuating pricing structure as it charges the user for only those activities that they wish to include in their trip. Users can also find exclusive online deals with these Klook Promo Codes for availing additional benefits only for the CollectOffers users. Do not forget to subscribe for CollectOffers subscription mail service to get the latest updates on the best deals and prices available at Klook.